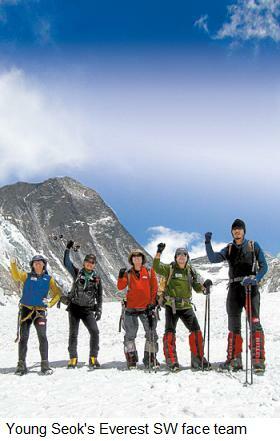 Best of ExplorersWeb 2009 Awards: Park Young Seok, new route on Mount Everest. Climbing all the 14x8000ers and walking to both poles, in 2005 Korean Park Young-Seok completed the world’s first Adventure Grand Slam. With him at the North Pole were two of his closest friends; accomplished high altitude mountaineers Oh Hee-Joon and Lee Hyun-Jo. Oh Hee-Joon used to deliver 47kg parcels to the Halla mountain shelter in Korea’s mountains to make money for his training lessons and was known for his remarkable strength. One year after the North Pole crossing he summited Everest from the north side – with Park who then traversed the mountain with another regular team-mate. Serap Jangbu Sherpa had summited K2 with Park in 2001, witnessing his 14th 8000er. Now a hard Everest descent awaited the two. The route was not yet opened leaving the climbers to come down without fixed rope or camps in worsening weather. With only one head-lamp, the exhausted men finally crashed in another team’s tent in camp 3 on Everest south side. The wild ideas mounted. The next year in 2007 Oh and Lee followed Park again, this time to attempt the SW face of Everest. This is where the triumphs ended. Oh Hee-Joon, 37, and Lee Hyun-Jo, 34, fell to their deaths high above 8000 meters. Of course Park Young-Seok knew that. Still he broke down. 6 months later he re-emerged from a serious boozing spree, ready to tackle the dreaded face again, for his lost friends exactly. 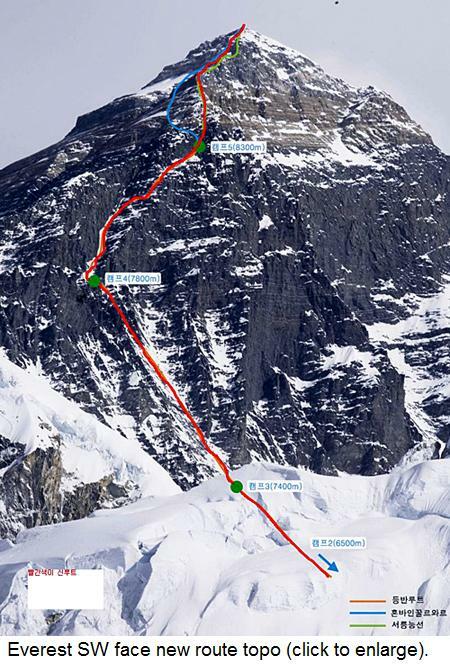 In that spirit, while all attention was focused on the normal route, Mr Park summited Everest this spring via a new line on the immense and technical SW Face. Related story: Breaking news: Mr Park climbs Everest SW face. Related story: Routes to climb Everest. Related story: StatCrunch, take 2: 8000er national ranking. Related story: Pete Poston’s Chomolungma Nirvana – the Routes of Mount Everest.